If you have a child with food allergies you know how important it is to alert the school, family and friends. AllerMates offers a full product line to keep kids with food allergies safe. 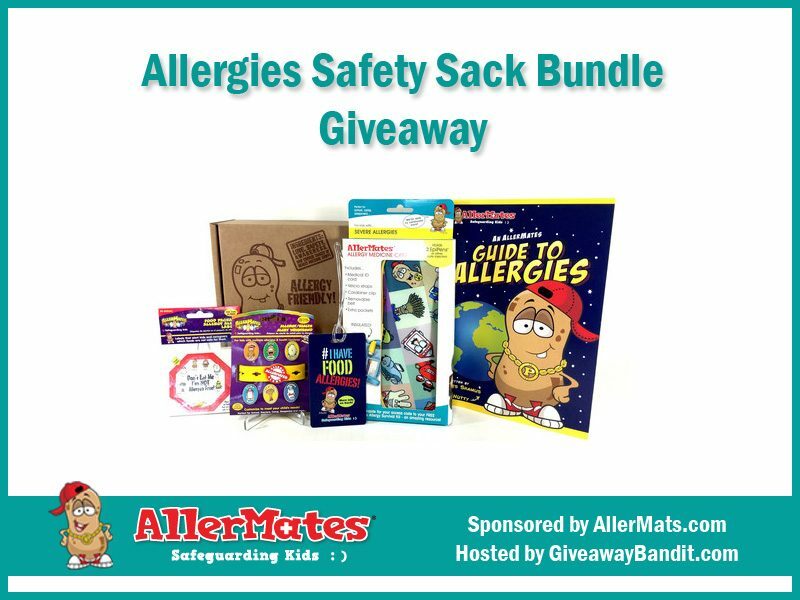 We are giving away an AllerMates Allergies Safety Sack Bundle below. Iris Shamus, founder and CEO of AllerMates, started the company after being inspired by her son, Ben’s, food allergies. She wanted to find a way to teach him about his health concerns in a way that was fun and non-intimidating. So, she drew up a few allergy-related characters, now known as the AllerMates gang, and wrote funny stories and poems about them. When she realized how much her son loved the characters and how well it helped him understand his allergies, she knew she had to introduce it to kids everywhere, and AllerMates was born. 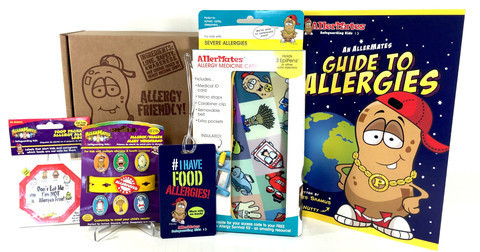 Now, AllerMates has grown into a line of medical alert bracelets, medicine bags, lunch bags, activity books, and more, all designed to keep kids with food allergies safe with a smile on their faces! Together, Iris and the AllerMates community work to raise awareness and keep kids with food allergies free from harm! Prize: Not sure what you need to keep your kids with food allergies safe? AllerMates has got you covered! Grab the I Have Allergies Safety Sack Bundle for all the tools you need to keep kids safe and smiling. Included in this bundle is a backpack/lunch bag tag and Multi-Charm bracelet to remind caretakers of your child’s dietary needs. To keep kids with food allergies safe at home, use the food alert labels so they know which items in the pantry to steer clear of, and An AllerMates Guide to Allergies book to teach them about their allergies. On-the-go? This kit has you covered there, too! Pack away medications in the included Allergy Medicine Case. Who knew keeping kids with food allergies safe could be so easy? The AllerMates EpiPen and Allergy Medicine Carrying Case was designed by a mom determined to make sharing kids’ allergy medication with friends, family, nurses, and teachers easy and convenient. Mission accomplished! This high quality, insulated medicine bag easily carries two EpiPens as well as an emergency contact and medical information card. Kids will be able to tote their allergy medication with them wherever they go in a fun, fashionable way! Help protect kids with food allergies in the kitchen! Use these fun and colorful AllerMates Allergen Alert allergy labels to mark which foods are off-limits for kids with food allergies. These allergy labels are designed to protect kids with common food allergies from eating foods that may trigger an allergic reaction! Parents, specify which of the common food allergies your child has right on the label. Have a babysitter or family friend coming over? Use these allergy labels to clearly show them which foods can not be given to your child. Kids with food allergies need all the protection they can get when it comes to going to school. Use the AllerMates Food Allergy Awareness Tag to send a “heads up!” reminder to teachers, coaches and other caretakers of your child’s food allergies. Plus, on the back of this nifty tag, there’s an insert card where parents can specify which food allergies their child has so everyone is properly informed! Teachers love this tag that helps them keep kids with food allergies safe in the classroom and the cafeteria! Does your child have multiple food allergies or health concerns? Alert caretakers of his or her’s special needs with just one bracelet! Adorn this bright, fun bracelet with various medical alert charms depending on your child’s health concerns or food allergies. 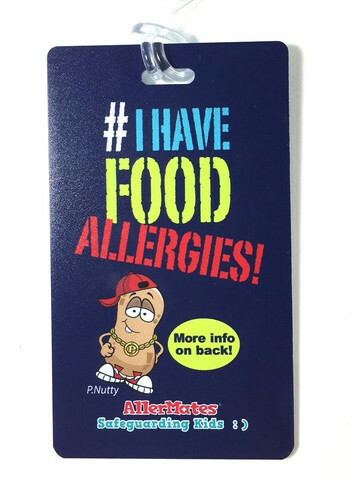 Medical alert charms included in this package are for the common food allergies of peanut, nut, dairy, egg, and wheat, as well as the health condition, asthma. Charms can be added, rearranged or removed so change the bracelet as his or her needs change! Let AllerMates spokesnut, P. Nutty, be your child’s guide to understanding allergies in this informative and fun book. Its 32 colorful, illustrated pages take your kid on a journey through AllerTown, where the AllerMates gang live, work and play. Characters representing the pollen, wheat and dairy allergies, among several others, stop in to help teach children all about what ails them. Not only is this AllerMates guide helping educating them on staying safe against their allergens, it’s allowing them to do it in a fun, non-intimidating and encouraging way, which is how kids learn best. So why not add this book to your arsenal of tools for creating awareness and protecting children against allergies? Giveaway is open to US only, ages 18 and older. Giveaway ends August 10, 2016 at 11:59 pm EST. Enter to win via the giveaway form below and good luck! I learned this after visiting their site; AllerMates was created after a scary incident at school involving our founder’s food allergic son. Our mission is to make learning about allergies and other health conditions non-intimidating for kids using the AllerMates gang! 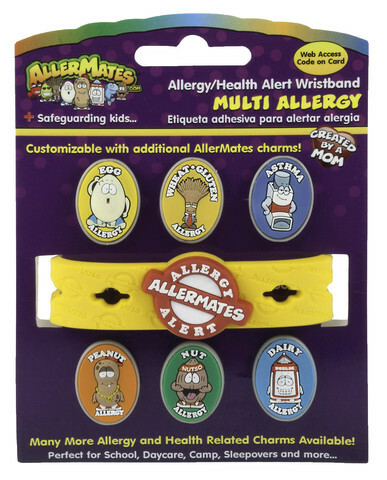 Each of our fun cartoon characters represents different allergens and health concerns, and are featured on many of AllerMates products, including our popular kids health bracelets. Something that i learned : Enjoy free downloadable resources. Medical advice. Support Groups.